M-Sport Ford World Rally Team’s Sébastien Ogier and Julien Ingrassia missed out on victory at this weekend’s Rally Italia Sardegna by the smallest of margins – less than a second separating their EcoBoost-powered Ford Fiesta WRC from the top-step of the podium. It took the competing crews three hours, 28 minutes and 18.7 seconds to complete 314.36 kilometres of gruelling terrain. Yet come the end of the rally, Ogier and his rival were separated by just 0.7 seconds. In essence, the five-time World Champion missed out by a heartbeat. Despite the initial heartache, the Frenchman was not disheartened. Taking good points with second place in the overall standings as well as the Power Stage, he may have lost this fight but the battle for the championship is far from over. Elsewhere in the field, there was a Frenchman at the wheel of a Fiesta who got to taste the victor’s champagne – Jean-Baptiste Franceschi piloting his Ford Fiesta R2 to a convincing victory in the WRC 3 category. “This is a day that rally fans will remember for a very long time. It was an incredible battle and fantastic for the sport, but obviously a little gutting to have missed out by such a small margin. At the end of the day, Sébastien delivered a fantastic performance. He pushed hard and gave it his best, but it wasn’t quite enough today. “For sure he will enjoy the summer break, and I’m sure he and Julien will come back strongly in Finland. We’re looking forward to the second half of the season and I’m confident that we can continue the fight. It’s clear that we have the pace, and that’s good motivation. “Teemu and Elfyn also had the speed to challenge for the top results this weekend, and the team will take a lot of confidence from that too – knowing that the Fiesta would have allowed all three crews to fight for the podium. Sébastien Ogier and Julien Ingrassia were locked in an intense final-day battle for victory at this weekend’s Rally Italia Sardegna. Ultimately however, and despite their best efforts, the Frenchmen had to settle for second place. Having taken the lead on Friday afternoon, Ogier maintained his position into the event’s closing kilometres. But with his lead trimmed to just 3.9 seconds on the eve of the final day, the reigning World Champion had something of a balancing act to contend with – taking the risks in pursuit of victory whilst ensuring he brought the Fiesta home for a haul of vital championship points. Ogier pushed hard and a thrilling battle ensued, but he finally lucked out by a mere 0.7 seconds – the joint third closest finish in FIA World Rally Championship history. “I don’t think I can be unhappy with this weekend. I did everything I could, but I have to say that I was not prepared to take as many risks as Thierry. We still have some work to do because we were losing some tenths here and there – especially in the slower, more technical sections – but it’s still a good result for the championship. Teemu Suninen looked on course for a second successive podium at this weekend’s Rally Italia Sardegna – holding a net third place through Friday’s closing stage (SS9) before being caught out by the notoriously challenging terrain. It’s easy to forget that this is just Suninen’s seventh event behind the wheel of a world rally car – the young Finn’s impressive speed defying his inexperience. This weekend however, that inexperience found the limits and his chance of another podium ended in the Sardinian undergrowth. Using the remainder of the event to gain vital knowledge for the future, Suninen will undoubtedly use the experience to his advantage and come back stronger as a result. “On Friday I was really happy with my speed. The feeling was good and the rhythm was coming quite easily – we were in the fight for the podium and weren’t taking any big risks. Then in the last stage I just pushed a little too hard on the old tyres and we went off. 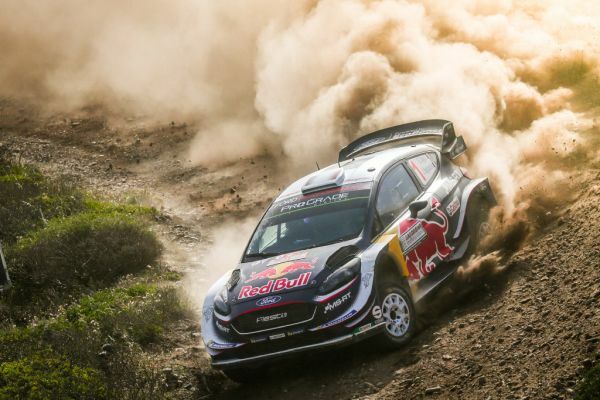 Elfyn Evans and Daniel Barritt missed an opportunity at this weekend’s Rally Italia Sardegna – having the speed to challenge for another top result before a small but costly mistake halted their charge through the early stages. Up until the 13 kilometre mark of Friday’s opening speed test (SS2), Evans was amongst the fastest through the challenging terrain. But the luckless Welshman clipped a bank and broke a steering arm. Having the necessary spares to affect a repair mid-stage, the pairing got the job done remarkably quickly but were then tasked with the unenviable job of sweeping a clean line through the loose gravel over the remainder of the weekend. Evans will now use the summer break to regroup before returning to Rally Finland where he secured a sensational second place behind the wheel of the top-specification Fiesta last year. “It’s been a frustrating weekend – especially as the feeling in the car was really good on Friday morning. A relevantly small error proved pretty costly, and when you drop 13 minutes there is very little to fight for.